US company, Kinemotive Corporation, has realized significant operational savings, including lost labor hours and scrap rates, after installing a MecWash AVD high-performance aqueous cleaning system. In addition to drastic reductions in rework costs (achieved by near zero failure rate), the company now saves thousands of dollars per year in the amount of solvent it must purchase to operate its now backup vapor degreaser, the cleaning equipment it had installed prior to the MecWash AVD. Kinemotive Corporation manufactures temperature sensors, pressure switches, fluid control valves, thermal actuators, vibration dampeners, and edge-welded bellows for the aerospace, defense, medical, industrial and semiconductor industries. These products are critical to the fail-safe operation of the equipment on which they are installed for companies like GE, Honeywell, Boeing, UTC Aerospace, Lockheed Martin, Silicon Valley Group, Varian Semiconductor and others. Before its purchase of the MecWash AVD, Kinemotive cleaned parts prior to assembly using a vapor degreaser. While this was effective for many Kinemotive parts, the vapor degreaser did not effectively clean parts that were machined upstream using water-based lubricants and coolants, This problem was particularly acute in the process of micro-welding bellows sensors. Bellows sensors are manufactured from chill rings – metal rings that can be as thin as a human hair. The chill rings must be absolutely free of contamination prior to being micro-welded or the encapsulated contamination will cause the weld to fail. If a single micro-weld fails, the entire bellows sensor is rejected. Some of Kinemotive’s bellows sensors are very complex, containing thousands of micro-welds. A micro-weld which fails during the assembly of a bellows of this design can easily cost the company thousands of dollars in lost labor and the scrapping of chill rings. After three rounds of cleaning trials, Kinemotive ordered the MecWash AVD, a high-temperature, ultrasonic, vacuum dry, aqueous vapor degreaser. When paired with MecWash System’s proprietary cleaning chemical AC-32, this high-performance aqueous cleaning system can remove almost any contamination – whether it is water or mineral-based. Although Kinemotive still has its original vapor degreaser, they do not use it often. Because Kinemotive requires such demanding cleanliness standards for its components, the actual configuration of the MecWash equipment installed at the company is a bit unusual. Kinemotive tests bellows sensors for functionality in silicone oil at very high heat. Afterwards, these components arrive at the MecWash AVD for cleaning. Silicone oil is a very tenacious oil to clean from metal surfaces. After this sensor testing, silicone oil becomes deeply embedded into the bellows, making the component extremely difficult to clean. MecWash Systems devised a process whereby these bellows sensors are first cleaned in an ultrasonic dunk tank built into the framework of the AVD that contains 100% MecWash AC-32 chemical at 140ºF. After the sensors are exposed to this ultrasonic bath in 100% AC-32, they are then moved to the MecWash AVD wash chamber to be cleaned using ultrasonic wash and rinse, flood wash and rinse, and spray wash and rinse cycles. The AVD cleaning process concludes with a 285ºF hot air blow dry and a deep-drawn vacuum dry to ensure that all moisture is pulled out of the now-contracted chill rings of the bellows. Another special requirement of this system is that the rinse tank water must at all times be absolutely pure, without any contamination at all. To achieve this requirement, MecWash installed its water polishing circuit. This polishing circuit purifies the entire quantity of water in the rinse tank in 15 minutes, less than the time needed to run one complete cleaning cycle in the AVD. The polishing circuit is also fitted with an alarm to let the operator know when it is time to change out the polishing cylinders. The MecWash AVD with this polishing device allows Kinemotive to achieve an extraordinary level of cleanliness for its components upon their exit from the MecWash AVD wash chamber. In 2011, Kinemotive spent nearly $50,000 on cleaning solvent. 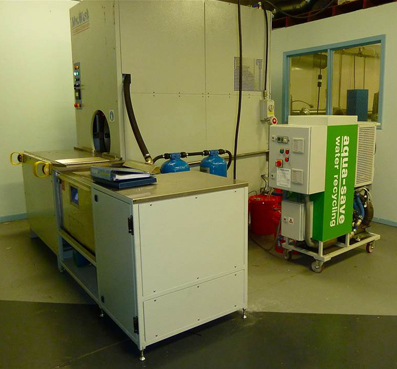 For the whole of 2012, 12 months after the installation of the MecWash AVD, Kinemotive trimmed that number to less than $15,000 – a saving of $35,000 in solvent purchased over the preceding year. For the new MecWash AVD, the company purchased $4,260 of MecWash AC-32 aqueous cleaning chemical in 2012. Thus, Kinemotive’s net savings on money spent for cleaning chemicals in 2012 was more than $30,000. Additionally, the failure rate of chill ring micro-welds in the assembly of bellows sensors has effectively been reduced to zero, saving the company thousands of dollars in lost labor and scrapped materials. And handling items just once allows the company to operate far more efficiently. “We’re pleased that Kinemotive has entrusted MecWash with its parts washing needs” said Bill Westbrook, North American Operations Manager for MecWash Systems. “Its experience shows firsthand the far-reaching aspects that cleanliness can have for manufacturers in demanding applications. Replacing vapor degreaseing solvents with aqueous chemicals saves the company a significant amount of money. Eliminating re-work and scrap is also very beneficial. We’re thrilled to provide a cleaning solution that meets Kinemotive’s rigorous cleanliness requirements and which also helps them to save money and operate more efficiently."